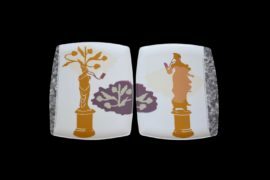 Charlotte’s ceramic work on exhibition at Ruthin is informed and inspired by the tradition of domestic everyday-ware and the manner in which it brought high art into the homes of a growing middle class. 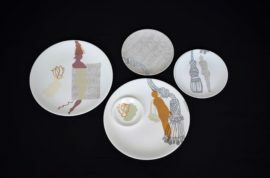 Her use of the ‘ready-made’ ware immediately locates the work within familiar experience and in particular into the female space of the kitchen or dining room. 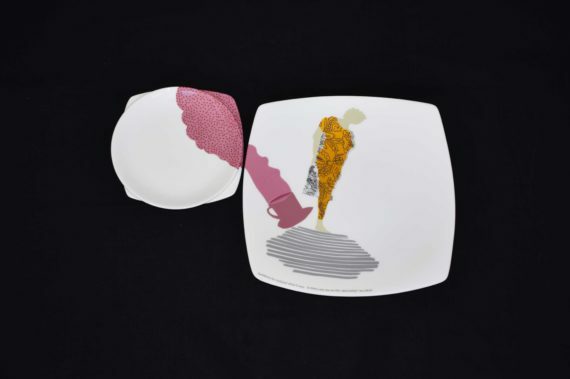 By taking these forms such as plates, bowls cups and saucers as ‘given’, she can transform them through her collage processes of cutting and layering. Both in her ceramic pieces and papercuts, she works across the surfaces in order to construct a tightly knit plan in which all the elements are held in tension. In this way, her work references activities that are very much associated with women’s work such as embroidery, tapestry and quilting.